Back on the market!!! 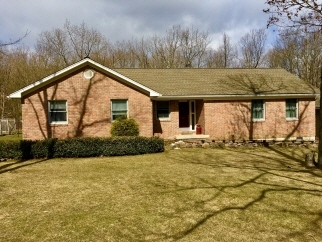 !Well maintained brick ranch home with 3 bedroom and 2 full baths and over sized 2 car garage with many upgrades located in an amenity filled lake development just minutes from the ez pass interchange for convenient access. This home features and open living concept with large living room, modern kitchen, master bath with hot tub, hardwood floors throughout. Bedrooms have custom built walk in closets. The exterior includes concrete paver patio with large hot tub, nicely landscaped yard with a combination shed and green house. This home is move in ready and won't last long in this market. Call today to schedule your personalized showing! Note: the seller has also listed the vacant lot at the rear of the property. Lot id#22a-51-fvi225.